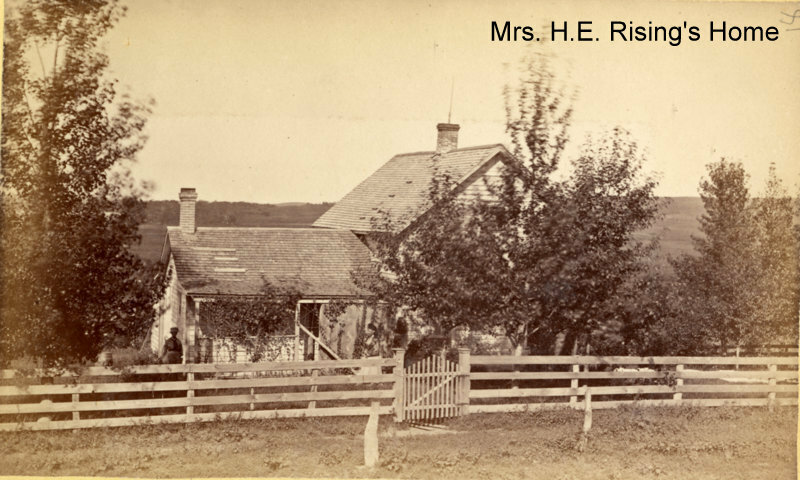 This week’s photograph shows the “Residence of Mrs. Rising’s” from 1876. The house stood on the SW corner of 1st Avenue and 1st Street NE. The tax records at the time list the owner as Mrs. H.G. Rising (not Mrs. H.E.). Henry G. Rising moved to Glenwood in with his widowed mother, two sisters and a brother and was the editor of the Glenwood Eagle in the early 1870s. By 1876, he had moved farther west, so the Mrs. Rising who owned this house was most likely his mother. This entry was posted in Local History and tagged Early Glenwood, Franklin Street, Fremad Association, Glenwood Eagle, Glenwood Minnesota, H.E. Rising, H.G. Rising, Pope County History, Trenham Photographs. Bookmark the permalink.